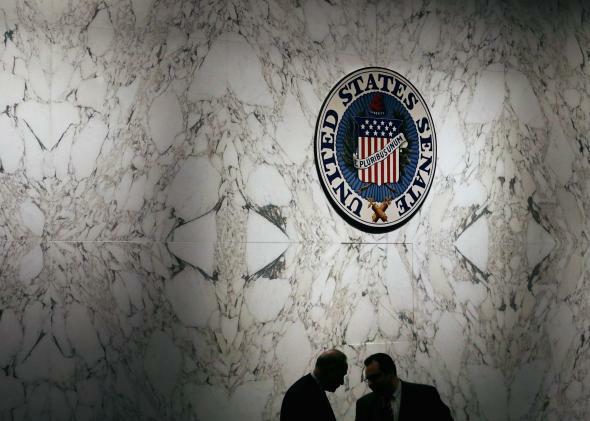 Senate approves USA Freedom Act. Sen. Charles Schumer, Democrat of New York, talking with a staff member in May. On Tuesday afternoon, the Senate approved the USA Freedom Act. The bill lays out new parameters for how government agencies will be able to collect data on citizens and generally conduct surveillance. The act has been in development since 2013, and in November it failed to pass the Senate after a Republican filibuster. The final version did not include proposed pro-surveillance amendments. President Obama has always supported the bill and is especially eager to sign it because crucial portions of the Patriot Act expired Sunday night. Sixty-seven senators voted in favor of the bill while 32 voted against it. The legislation will end NSA bulk collection of phone records; require that private companies store approved surveillance collection data so government agencies don’t hold it themselves; and place a public advocate in the Foreign Intelligence Surveillance Court (the body agencies go to to get warrants and approvals). The National Security Agency, which halted much of its broad phone surveillance on Sunday night as portions of the Patriot Act expired, will resume and taper off the process over six months, because the bill includes a transition period. We applaud the Senate for finally approving the House-passed USA FREEDOM Act. [It] ends bulk collection, strengthens civil liberties protections, increases transparency for both American businesses and the government, and provides national security officials with new, targeted tools to keep America safe. American Civil Liberties Union deputy legal director Jameel Jaffer told NPR, “This is the most important surveillance reform bill since 1978,” when the Foreign Intelligence Surveillance Act was passed.